For years, nutrition professionals have cautioned parents about the adverse effects that the overconsumption of sugary drinks can have on their children’s health. Yet the 2010 Dietary Guidelines for Americans, the newly released Choose MyPlate nutrition education initiative, and the Fruits and Veggies More Matters campaign advise parents that 100% fruit juice can fit healthfully into their child’s diet when consumed in moderation. As a result, millions of parents look to fruit juice as a good source of vitamins and minerals, making it a staple in their refrigerators and kitchen pantries. But during the last six months, concerns have surfaced regarding the manufacturing of fruit juice, with heightened attention given to arsenic, which has made its way into apple juice and other beverages many children drink daily. This concern was brought to the public’s attention last September when The Dr. Oz Show used an independent lab to test five different brands of apple juice for arsenic.1 According to the findings, 10 samples of apple juice came back with arsenic levels higher than what’s currently allowed in drinking water by the FDA and Environmental Protection Agency (EPA), which is defined as 10 parts per billion.1,2 This discovery sparked a nationwide debate on both the accuracy of the tests as well as the implications of these findings. Arsenic is a naturally occurring element found in the air, water, and soil, so everyone is exposed to trace amounts of it all the time. But arsenic also can result from contamination through the use of agricultural pesticides.2,3 Two types of arsenic exist: organic and inorganic. Research indicates that inorganic arsenic is the primary contributor to adverse health effects in people who experience long-term exposure. Studies show it’s associated with a higher risk of cancer and cognitive delay in children.2,3 However, some evidence suggests that certain types of organic arsenic also may pose health risks.2 The more toxic inorganic arsenic is found mostly in pesticides that have been banned in the United States for decades. The FDA challenged Dr Oz’s interpretation of the test results, noting that the arsenic found in the apple juice varieties he tested was largely organic, making the levels virtually harmless.3 Nonetheless, later tests by Consumer Reports indicated that several brands actually contained inorganic arsenic.4 These brands could have been imported from countries where pesticides containing inorganic arsenic are used legally. It’s logical for parents to question whether buying organic juices for their children is safer than nonorganic varieties and that in doing so they’ll eliminate the possibility of consuming contaminants. In this regard, both Johnson and the FDA remind parents there’s no current scientific evidence that proves buying organic will eliminate the exposure to potential contaminants. While Johnson notes that research indicates children given organic produce have less measurable pesticide residue in their blood, “what this means, long-term, isn’t known.” In the case of arsenic exposure, just because pesticides aren’t used on the apples doesn’t mean the product won’t contain it. As Johnson asserts, organic apples also grow in soil that may contain arsenic. While parents don’t need to eliminate juice from their child’s diet, Johnson recommends they limit intake “not necessarily to avoid arsenic [or other contaminants] but because of caloric density,” which may contribute to overweight and obesity and the development of dental caries. Parents should focus on serving a variety of whole fruits and vegetables so their children can get the maximal nutritional benefit. — Christina M. Barth, BA, is a recent graduate of an ACEND-coordinated program in dietetics. 1. Dr. Oz investigates: arsenic in apple juice. The Dr. Oz Show website. http://www.doctoroz.com/videos/dr-oz-investigates-arsenic-apple-juice. September 12, 2011. Accessed April 12, 2012. 2. Questions & answers: apple juice and arsenic. US Food and Drug Administration website. 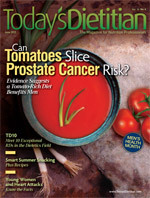 http://www.fda.gov/Food/ResourcesForYou/Consumers/ucm271595.htm. December 16, 2011. Accessed April 12, 2012. 3. FDA statement: arsenic in apple juice. The Dr. Oz Show website. http://www.doctoroz.com/videos/fda-statement-arsenic-apple-juice. Accessed April 12, 2012. 4. Consumer Reports tests juices for arsenic and lead. Consumer Reports website. http://news.consumerreports.org/safety/2011/11/consumer-reports-tests-juices-for-arsenic-and-lead.html. November 30, 2011. Accessed April 12, 2012. 5. Ginsberg G. Orange juice shows us the toxic side of international trade. The Huffington Post website. http://www.huffingtonpost.com/dr-gary-ginsberg/orange-juice-toxic-pesticides_b_1215160.html. January 19, 2012. Accessed April 12, 2012.